Pasta House Pasta con Broccoli - This is an Alfredo based sauce that combines pasta, fresh mushrooms, and fresh broccoli. Home » Copycat Restaurant Recipes » Pasta House Pasta con Broccoli – This is an Alfredo based sauce that combines pasta, fresh mushrooms, and fresh broccoli. Pasta House Pasta con Broccoli – This is an Alfredo based sauce that combines pasta, fresh mushrooms, and fresh broccoli. This is an Alfredo based sauce that combines pasta, fresh mushrooms, and fresh broccoli. 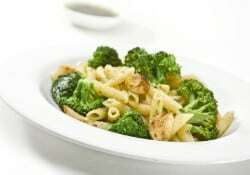 – This is an Alfredo based sauce that combines pasta, fresh mushrooms, and fresh broccoli. Cook noodles until half done. Drain water. Add cream, butter, garlic, tomato sauce, and broccoli; bring to hard boil When noodles are cooked, add mushrooms. Remove from heat; add cheese. Hi, is it correct when saying only one ounce of broccoli, tomato sauce and mushrooms? ?